Gov. Janet Mills delivers her inaugural address after taking the oath of office, Wednesday, Jan. 2, 2019. Wednesday night, Maine and Janet Mills made history. 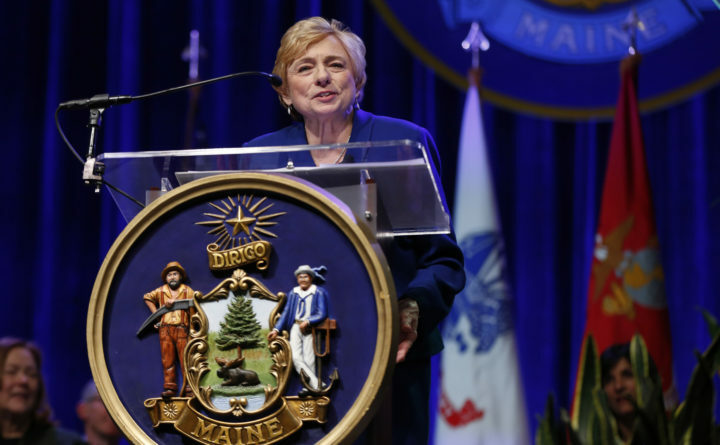 After nearly 200 years as a state, Maine finally inaugurated its first female governor and, as Mills noted, the first chief executive from Franklin County. So it was fitting that Mills, the state’s first female attorney general and the first woman district attorney in New England, focused on the message her inauguration sends. She read from a note from a 8-year-old Maine girl who now believes she too can be governor some day. She cited a note a mother put in her daughter’s lunch bunch the day after Mills was elected governor. Beyond the historic first, Mills reiterated a message of hope, unity and love in her brief speech at the Augusta Civic Center. It was a welcome departure from the divisive and sometimes hateful words that too often come from Washington, D.C. and Augusta. Eight years ago, former Gov. Paul LePage also talked of working together to make Maine a better place to raise a family and start a business. But he also laid the groundwork for divisions and negativity that would define his governorship, along with his inability to stop undermining his policies with unnecessary — and often inaccurate and insulting — comments. The challenge for Mills will be to sustain and spread her optimism and hope while working in a system that is set up for slow, incremental changes, which can be easily derailed by opponents and inertia. Those potential dangers come later. Wednesday night was about history, inclusion and love, a word few politicians use. Speaking of love, Mills said: “It is the bond we all share for our state, for children longing for security, for newcomers seeking to belong, for all of those who feel left behind, who long for respect and dignity. One thing we all love is our great state. “We are one Maine, undivided, one family from Calais to Bethel, from York to Fort Kent,” she added. Lofty rhetoric for sure, but it is an important reminder that Maine, a small state tucked in the far corner of the United States, must work as one to face our many challenges. Pitting rural areas against Portland or denigrating people “from away” puts unneeded stress on the ties that hold Maine together. “We are all in this together… Though we all agree on the goal, we differ about how to get there,” Mills said. Later, she added: “Our diversity is a virtue — one that we should harness to advance good public debate and good public policy. We welcome the voices of newcomers to the public conversation — the young, immigrants, people of different cultures, people of color, people of different orientations. Mills also highlighted policy initiatives that were cheered by Democratic supporters. She plans to install solar panels on the Blaine House and make climate change and renewable energy a priority for her administration. She pledged to expand Medicaid (she signed an executive order to move forward with this process on Thursday) and lower prescription drug costs. She promised “a helping hand” and a director of opiate response to better tackle the state’s substance abuse crisis. As with her predecessors, Mills will be judged by whether she fulfills these promises. To begin to do so, she will need to work with a diverse coalition of lawmakers and constituents. Her speech laid a solid foundation for that work.